Student Council President Melia Baker explained that the poet John McCrae symbolized poppies growing in France and Belgium with the blood of fallen WWI soldiers in his poem “In Flanders Field." Vice President Gracie Manis retold the history of how WWI ended on 11/11/1918 at 11 AM, bringing an end to the bloodiest war the world had known up to that time. The date became known as Armistice Day. In 1954, President Dwight D. Eisenhower, who as Supreme Allied Commander had defeated Hitler in World War II in 1945 and then as president ended the Korean War in 1953, changed Armistice Day to Veterans Day to honor the service of all veterans, in both war and peace. Army Staff Sergeant Robinson Jaramillo was the guest speaker. Born in Venezuela, Jaramillo was a 2002 graduate of McMinn County High School who found himself drifting after high school. He joined the army where he found a family of fellow soldiers and a passion to serve his adopted country. He expressed his gratitude for all the veterans who had gone before him to protect American tradition of liberty. At the end of program, Tristen P. Rowland, Central’s music teacher, performed “My County Tis of Thee” on the piano to accompany a slide show of pictures of thirty-seven veterans submitted by both students and teachers. It was a fitting conclusion to an hour dedicated to those who dedicated their lives for the freedoms that we enjoy. 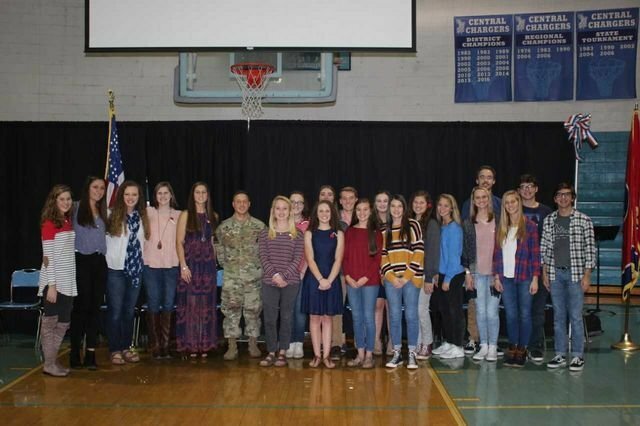 Photo Caption: Army Staff Sergeant Robinson Jaramillo (in uniform) was the guest speaker at Central High School’s Veteran Days program organized by the CHS Student Council. Ms. Teri Blair and Mr. Travis Tuggle are the sponsors of CHS Student Council.